Being a woman, Tienie asked if I would write my story on my trip to Africa. I thought "SURE why not?" I was a woman with no desire to go on a hunting safari to Africa and here I was, having the trip of my life. "You want ME to go to Africa?" No Way, No Desire! 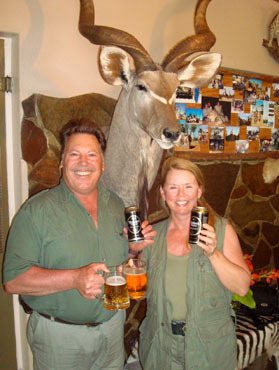 Duke (spouse) and I were invited to go to a wild game dinner with auctions being held by SCI (Safari Club International) in February 2007. I have never been to a Live Auction, or Silent Auction, for that matter, so I did not know what to expect. On our way there, I told Duke to bid on a hunt out west - Colorado, Texas, Montana, for elk and I would buy that for his birthday present. OK Cool! Auction starts and with encouragement he finally agrees to bid on a hunt. Next thing I know he is bidding. I look at the sheet and realize he is bidding on a trip to Africa. "ARE YOU CRAZY? That's Africa you are bidding on". His response: "I know". A year to plan and I told him at the beginning that I will not go. The package was for 2 hunters so he asked my brother who has a big dream to go to Africa to hunt. So the two of them planned. Duke bought safari clothes, boots, accessories, and everything he needed for his hunt. They finally schedule it for April 4-16th, 2008. One month prior to departure, my brother backs out to the trip (due to special project with job). Now what?! No way was Duke going by himself, and with little time, no other hunting buddies could manage to go with him. So guess who needs to go? ME!! For the next month I shopped till I dropped. I was told I had to buy olive green safari clothes - YUK! I hate olive green on me, plus I hate to shop. I went through quite a few emotions for the next month: insomnia, nausea, fear, even anger. All I could think of was: Bugs, poverty, killer animals, aids, hot weather, and spending money on ugly olive green clothes. After getting used to the idea of going and 19 hours of flights time, we arrive in Windhoek, Namibia. We were greeted by 3 smiling faces: Hendrik Jacob, our PH (professional hunter) for the first 6 days, Francois the PH apprentice, and Amanda our pilot. They all work for Africa Thirstland Safaris. We board yet another plane (a small 5 passenger). 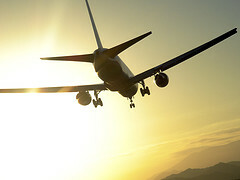 Next thing I know we are going to land on a dirt runway! Next we board a safari truck and they take us to a beautiful and brand new lodge. 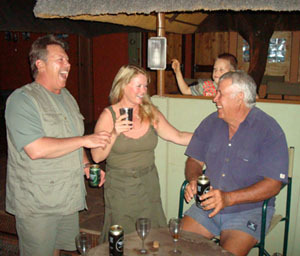 Duke and I were the first guests and it is the new home of Africa Thirstland Safaris. 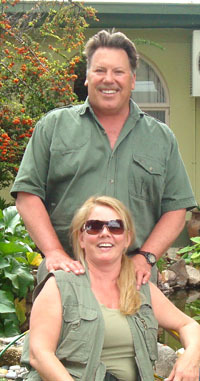 We were greeted by Annette Honiball (co-owner of Thirstland Safaris along with her husband, Kobus who was our second PH). We had a lot of the day left and Duke was excited to go hunting. We board the safari truck and go. WOW - the animals! The next six days with Hendrik and Francois at 2 different lodges was a blast. The animals were plentiful, but yet challenging, and it was very entertaining for me. Needless to say, Duke was having the time of his life. Between the 2 ranches, the trophy's Duke harvested was: Steenbok, Gemsbok, Springbok, Black Backed Jackal, Red Hartebeest, Warthog, and the most special was the Greater Kudu he got on his birthday. Then Kobus Honiball joined us and he takes us yet to another place. We board the plane now piloted by Kobus, and were off to the Kalahari. The Kalahari? Where and what is that place? I didn't know. I did not think anything could possibly top the places we had just been. WOW, WOW, WOW, Is all I can say. What a beautiful place and what really made this place very special, was the people. Kobus kept telling us that we are going to love the Kalahari and couldn't wait for us to meet his friends: The Duvenhage family. The Duvenhage family: Hendrik, Isabella, Michael, Tienie, and three beautiful kids own the Uitspan Hunting Ranch, and really made us feel at home. The love they have of family shines through and this family enjoys making sure you feel comfortable and enjoying yourself and I should add - the food... WOW what great cooks! What make my heart shine was the love and respect they have for their land and the animals. The animals were abundant and they were precise on which animal Duke was to take. Lots of patience to make sure Duke could take a great trophy. Trophy's taken were: Grey Duiker, Impala (beautiful 9 year old daughter Maria joined us on this hunt), Bat Eared Fox, Genet Cat, Blesbok, and most special here was the Blue Wildebeest. I went on all Dukes hunts and never knew it could be so relaxing and exciting at the same time, and most of all - SPIRITUAL! Three days was not enough time to spend on this ranch and I truly did not want to leave. Couldn't believe I even had tears in my eyes when we had to say goodbye. Go home? Please NO, I want to stay! In summery: Duke and I have been a lot of places, and nothing compares to the most relaxing and beautiful vacation I have ever had: NAMIBIA! My lesson learned: Do not be a pessimist about something you have no knowledge of! As for my fears? NOT! I felt safe at all times... the weather was beautiful... no bugs... no poverty (we were in the bush)... and no town close enough to go shopping. Yeah! (remember: I hate to shop) The ugly green clothes? Love them now. The Kalahari? The most beautiful, peaceful, spiritual, majestic, awesome place I have ever been. As for the people: I love them all and they will forever be in my heart! 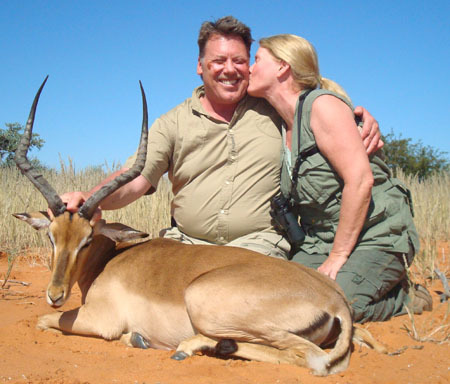 Any woman having any questions about going to Namibia and especially Uitspan Hunting Ranch in the Kalahari, please do not hesitate to contact me for your questions to be answered by a woman who did not want to go and now can not wait to go back!! 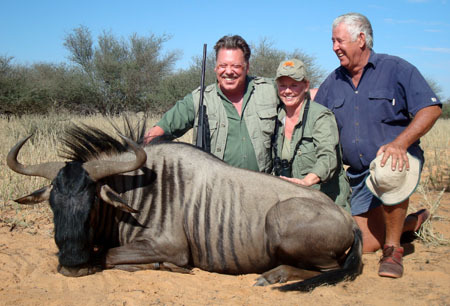 Feel free to contact me at this link if you have any question about hunting in Namibia, Africa.